Winding Trails has been a part of the Farmington community for over 65 years. The first half of its existence, it was called The Recreation Association. The Recreation Association sought to help the community, including veterans and their families by approaching the Avon Old Farms School to secure permission to use 20 acres of land surrounding Walton Pond. With permission in place, the group organized Winding Trails Summer Camp. They leased the property for the next 8 years from the School for $1.00 a year. It was the perfect place for a summer day camp. 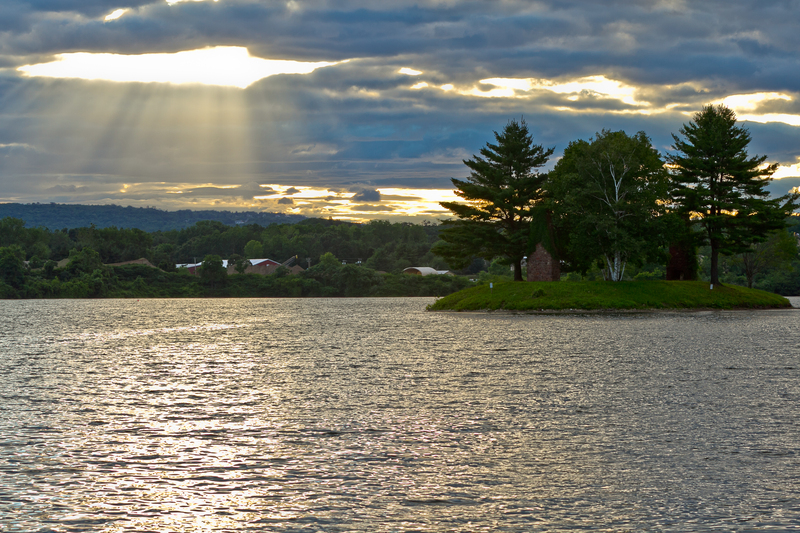 Walton Pond was an eight acre body of water shaped like an hour glass with an island in the center. With a dam at the south end, it was fed by Poplar Swamp Brook and several natural springs. Walton Pond sat in a narrow valley surrounded by upland forest which provided an ideal location for young people to gather as a camp community. By 1952, Winding Trails Summer Day camp had 201 campers over an 8 week season with the average camper staying for 4 weeks. Camp at that time consisted of a 4 day week that cost $4.25 including transportation. In 1953, enough boats had been acquired to offer boating as a program at Camp. Canoeing and boating on Walton Pond was introduced and Winding Trails Camp really started to grow. But the problems of leasing the land yearly and not being able to build infrastructure became a problem. The Association started negotiations for a long term lease or to purchase the land from Avon Old Farms School. During the 1960’s Winding Trails, owning its own property, started to physically take shape. Four pavilions for campers and family picnics were built above Walton Pond by the Seabees out of Waterbury (The Navy’s building division). The HFPG gave grants that assisted in building Garmany Hall, a large capacity meeting and program hall that could hold 125 people. The camp bathhouse and the caretaker’s house were also built. With the addition of property and new buildings came new problems the Board had to grapple with. Money or lack of it was always an issue. There were disputes over guns and hunting on property as well as horseback riding, motorcycles and snowmobiles. The increased vandalism was the impetus for a full-time caretaker and a need for their housing to be on property. Another result of the capital expenditures at Winding Trails was the continuing debate over recreation being tax supported through the town or the continued operation through The Association. The Association was willing to manage the town-wide programs but was increasingly unwilling to bear the cost of maintaining all the off-site facilities. During this time period, family memberships and rentals of the Winding Trails facility to community groups were enacted. In 1968, Mort Dunning from Dunning Sand and Gravel started to mine gravel out of Poplar Swamp which sat at the southern boundary of Winding Trails and would eventually become Dunning Lake. The Association also started to develop and expand some trails within the park in order to expand their nature programs. Just after World War II, Avon Old Farm School had been closed down and leased to the federal government as a hospital for the blind. It reopened in the fall of 1948. In 1955, the Recreation Association approached Avon Old Farms School with a bid to purchase the 20 acres of property surrounding Walton Pond for a permanent site for the camp. Avon Old Farms School was looking for an infusion of money. This led to an opportunity to buy 300 acres of land for $100 an acre instead of just the original 20 acres. The Recreation Association jumped at the opportunity to own the 300 acres around Walton Pond. The Association then formed a non- profit organization named the Recreation Association of Farmington in order to raise money to purchase the property and provide buildings and facilities for the camp. The cost was divided between the Association, Town of Farmington and a grant from the Hartford Foundation for Public Giving (HFPG). This grant from the HFPG, which is one of the oldest and largest Foundations in the country, was the first grant ever given by the HFPG for recreation. It also solidified a relationship between Winding Trails and the HFPG that continues to this day. The Recreation Association was managing all the recreation activities for the Town of Farmington in addition to the summer camp. Many of the activities were run off property at a building on Church Street. That space provided an office for the Executive Director and also held; a nursery school, rifle range, dance studio, and arts and crafts classes. At the local schools, the Association sponsored afterschool basketball, volleyball and gymnastic classes. The operation of the Lion’s Club Memorial Pool in Unionville, and summer playground programs, were also the responsibility of the Association. In 1957, Winding Trails Camp dredged the southern portion of Walton Pond and built a classic summer camp “H” dock and a couple rafts in order to teach swim lessons and guard general swims. In the 1970’s, the organization saw a major change in focus. Public opinion for town supported recreation finally pushed the town council to act and the Town of Farmington hired its own Recreation Director. They worked with the Association in the early years before setting up their own department and taking over all of the town’s recreation needs. The organization known as The Recreation Association of Farmington changed its name to Winding Trails to avoid confusion with the town’s new Recreation Department. The non-profit now known as Winding Trails kept its mission and concentrated on the development of programs and facilities within the park with dwindling town support. In 1973, Winding Trails began its cross country ski program with just 25 sets of skis. Judy Shea, mother of Olympic Bobsledding gold medalist Jim Shea, helped design the trail system and was one of the first instructors. Mort Dunning deeded the first 40 acres of Dunning Lake to Winding Trails. This provided a large pond for swimming, boating and fishing at the south end of the property. A capital campaign was initiated and a beach, bathhouse, and boathouse were built along what would become Dunning Lake. The 1980’s was a decade of planning and slow growth. A long range master plan was developed for the facility and programs. The second 45 acres of Mort Dunning’s work was deeded to Winding Trails for a $1 and the 85 acre Dunning Lake was completed. The cross country ski program continued to grow and moved to a new level with the purchase of snow grooming equipment. The main office was built in 1985 in honor of Henrietta Roosen who served as Executive Director from 1968 – 1983. It was the first onsite office space for the organization. It housed the Executive Director,the first full time Camp Director and a secretary. The Camp Director expanded the growth of camp over the next 20 years from serving 478 campers a summer to over 2,000. The 1990’s was a time of rapid expansion and growth. Membership and Camp increased steadily and staff was added to provide additional programs and service to our constituents . The lodge was built to house the new camp office along with a conference room and two activity rooms that provided additional indoor space. The first full time Program Director was hired and the Sportsplex was built. At the time, Winding Trails had a single basketball court and very crude baseball diamond. The new sports complex consisted of clearing 11 acres of land and mining the gravel out of the area and adding a foot of topsoil. When it was finished, Winding Trails had a sledding hill, soccer field, real baseball diamond, 3 basketball courts, two volleyball courts, a bocci court, a new playground and parking lot. A state of the art Ropes Course was built slowly in the woods overlooking the Sportsplex. This addition of expertise, field and court space, expanded indoor facilities and a new ropes course served to expand many programming opportunities. Today, Winding Trails offers over 400 programs a year and has the largest Outdoor Adventure Ropes Course in the state. The new millennium brought reflection and change. Heidi Martin, Executive Director for 22 years retired in 2005 and Scott Brown took over the position. Through an active Board of Directors and a motivated staff, Winding Trails rededicated its commitment to the community, love of the outdoors, and promoting leadership and lifeskills. Celebrating community brought: Last Blast, a beach party and fireworks celebration attended by thousands, new seating in the amphitheater for 600 people, partnerships with area non-profits and community groups, and improvements to the park for children and families to congregate and play. Our commitment to the outdoors brought conservation and environmental education to the forefront with the hiring of a full time Education Director. With the help of a Naturalist, this led to forest stewardship research, water quality analysis, wildlife inventories, and started the Save Walton Pond Project. All of these activities expanded environmental education opportunities at Winding Trails. Winding Trails promoted leadership and lifeskills through thoughtful and intentional programming. A focus on lifeskills was dedicated to enriching the lives of young and old through programs and volunteer opportunities. Leadership skills and opportunities were accomplished through staff training and development that teaches and mentors young people in strengthening character, leadership, and responsibility. In 2010, Winding Trails took on the largest capital project in its history with the Save Walton Project. Walton Pond is the 8-acre pond that the summer day camp started on back in 1947. Over the past 6 decades it got filled up with sediment and weeds and was literally dying. The summer of 2010, over 2,000 children moved 17,654 fresh water mussels, fish, turtles, and frogs from Walton Pond to Dunning Lake. In 2011, Walton and Trout Ponds were dredged and their dams rebuilt. In addition, boardwalks with educational kickouts and a new arch bridge to the island were built. A new Walton Pond brought an influx of people to the area. This prompted an anonymous gift that jump started a new nature building called Nature’s Porch that was completed in 2013. In 2015, Winding Trails completed a 10 Year Master Plan for Dunning Lake Beach and Picnic Area. This plan outlined 12 initiatives to be completed over the next 10 years. The first major project was the construction of the Boathouse Pavilion in 2017. This 40 x 80 pavilion has sitting for 180 people upstairs. The downstairs is divided into thirds with 1/3 being used for lifeguard lockers and teaching area, the second third houses the boat rental area with lifejackets, paddles, and a variety of boats, the final third section is for maintenance of our boats. Additional pavilions have been constructed for lifeguards and first aid along with improvement to the beach, sidewalks, and drainage. As a whole Winding Trails continues to do well serving its members, campers, and program participants with a beautiful facility and quality programs. The summer day camp has been named Best Camp by Hartford Magazine 6 of the last 7 years. With over 600 campers per day, Winding Trails Summer Day Camp is one of the largest programs in the state. Interest in membership at Winding Trails hit an all time high in 2018 with over 1100 families on the list. What the next few years will bring is unknown, but with a dedicated seasoned staff and volunteers committed to always improving the organization, it should be promising.